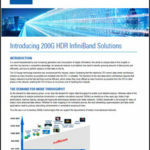 A new whitepaper from Intel looks at Truescale InfiniBand performance for HPC applications. There are two types of InfiniBand architectures available today in the marketplace, the first being the traditional InfiniBand design, created as a channel interconnect for the data center. The latest InfiniBand architecture was built with HPC in mind. This enhanced HPC fabric offering is optimized for key interconnect performance factors, featuring MPI message rating, end-to-end latency and collective performance, resulting in increased HPC application performance. enhanced intel True Scale Fabric Architecture – Offers 3x to 17x the MPI (Message Passing Interface) message throughput of the other InfiniBand architecture. For many MPI applications, small message rate throughput is an important factor that contributes to overall performance and scalability. Intel tested a number of MPI applications and found that they performed up to 11 percent better on the cluster based Intel True Scale Fabric QDR-40 (dual-channel) than the traditional InfiniBand-based architecture running at FDR (56 Gbps). Download the whitepaper (PDF).